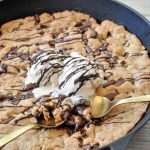 Are you ready for cookie season? These Chocolate Dipped Vegan Ginger Cookies are exactly what you should start with! They’re easy to make and so warm and savory. It’s cookie season and I’m so excited! This is one of my favorite times of the year. I love the change of seasons, the lights and decorations, the smell of Frasier fir, family time, watching Elf and all of the Christmas movies, parties, and baking for my friends and family. Truth be told, I’m not a big sweets lover, but I do love making them for others. It’s such a relaxing and happy time to be in the kitchen when you’re whipping up something special for the people you care about. And what makes the baking season even better, is that now I get to create new recipes, and share my tried and true family favorites with all of you. Sweet! 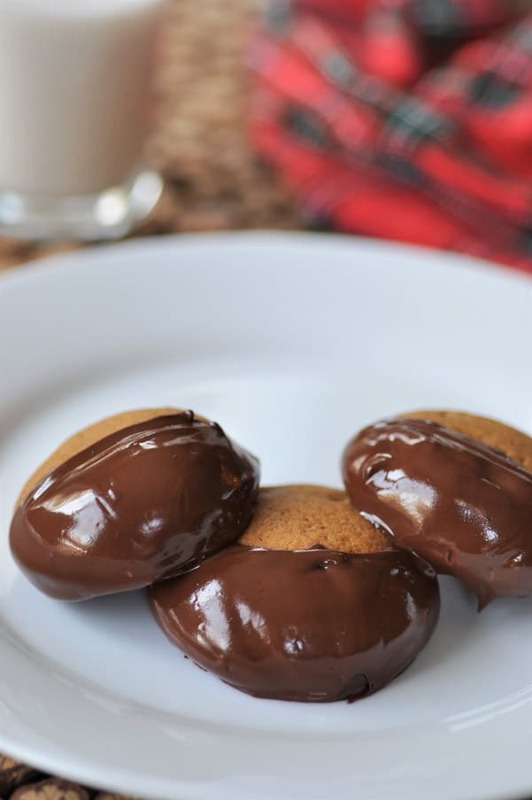 Let’s kick off the holiday season with my Chocolate Dipped Ginger Cookies. These are fabulous! Even though I’m not a lover of desserts, I do adore these ginger cookies. They’re not sweet, they’re warm and savory. The ginger, nutmeg, allspice, cloves, and molasses give them an earthiness that’s beyond delicious. 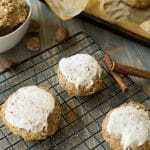 They’re also refined sugar-free cookies. They’re sweetened with pure maple syrup, which compliments the wintery spices and gives just the right amount of sweetness. 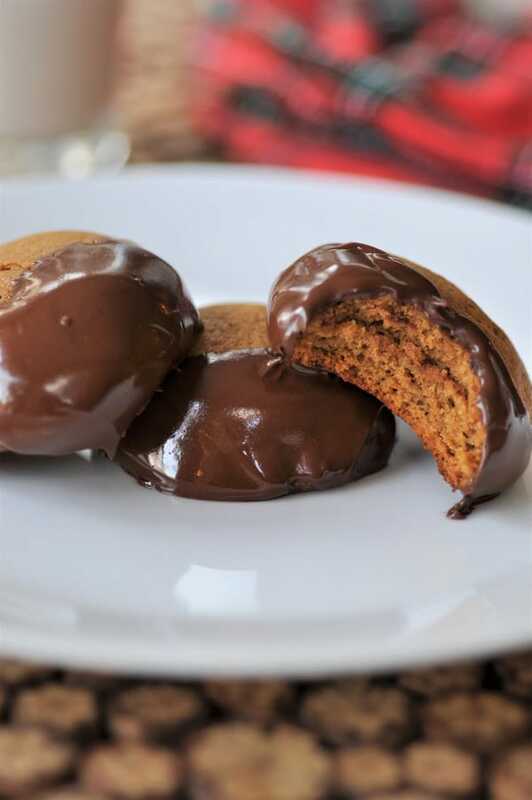 Another wonderful thing about these chocolate gingerbread cookies with molasses is the texture. They’re like soft pillows with a slightly crisp exterior. You don’t need to worry about breaking a tooth when you bite into them, unlike ginger snaps, which are ridiculously hard. 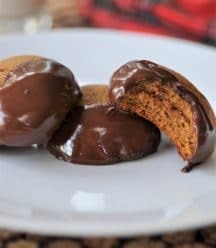 So do you want to kick off the holiday baking season with this chocolate dipped ginger cookie recipe? Yeah, I thought you might. Let’s do it! First – Whisk the dry ingredients together in a medium bowl. Second – Beat the vegan butter and the wet ingredients together until well combined. The butter won’t get creamy, it’s all right. Third – Add the flour to the wet ingredients and beat until just combined. Fourth – Refrigerate the cookie dough for an hour so it sets. 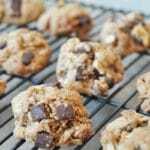 Fifth – Scoop out a tablespoon of the dough and roll it into a ball and place on the cookie sheet. Bake for approximately 15 minutes, or until they’ve flattened into puffy discs and are firm to the touch. Sixth – Dip them into melted chocolate when cool. Finally – Eat them, share them, give them. 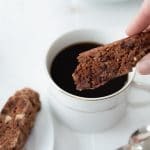 I made two batches of these chocolate ginger cookies, one of them with all-purpose flour and the other with an all- purpose gluten-free flour. The only difference was that the GF cookies didn’t puff up as nicely and the texture was slightly gritty. This is something I find in most GF baked goods, whether I buy them from a bakery or make them from recipes I’ve found on the web. It’s not horrible, they tasted great, but the texture was different. Just know that if you want to make them GF you can, but be aware that they won’t be exactly the same as the conventional recipe. I’m attending my first holiday party of the season this week and I can’t wait to bring a batch of these and a batch of my Cranberry Chocolate Macaroons to share with everyone. I’m also going to bring a tray of Onion Confit Tartlets that Alex made for a Thanksgiving appetizer. Holy moley you guys, you’re going to love that recipe! It will be on the blog on Monday, so look for it. In the meantime, make a batch or two of these chewy gingersnap cookies. You can freeze them for later if you don’t eat all of them first. Let me know what you think of them. I always love hearing from you. And, let me know if there’s a favorite cookie that you’d like me to veganize. I’m always up for the challenge. Warm, chewy, and delicious chocolate dipped ginger cookies! They're vegan and there's a gluten-free option. In a large mixing bowl, beat the wet ingredients, including the butter, together until the butter breaks down. It won’t get creamy so don’t worry about that. Add the flour mixture to the butter mixture and beat until just combined. Refrigerate for an hour to set. Preheat oven to 350°F (176°C) and line a baking sheet with parchment paper. 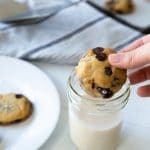 Scoop out a tablespoon of the dough and roll into a ball, continue the process with the rest of the dough, making sure to separate the cookie dough an inch apart on the cookie sheet to leave room for the cookies to expand. Bake for approximately 15 minutes, or until they turn into puffy discs and are firm to the touch. Cool on a wire rack. In a small bowl, melt the chocolate chips in a microwave until smooth and creamy. Approximately 4 minutes. 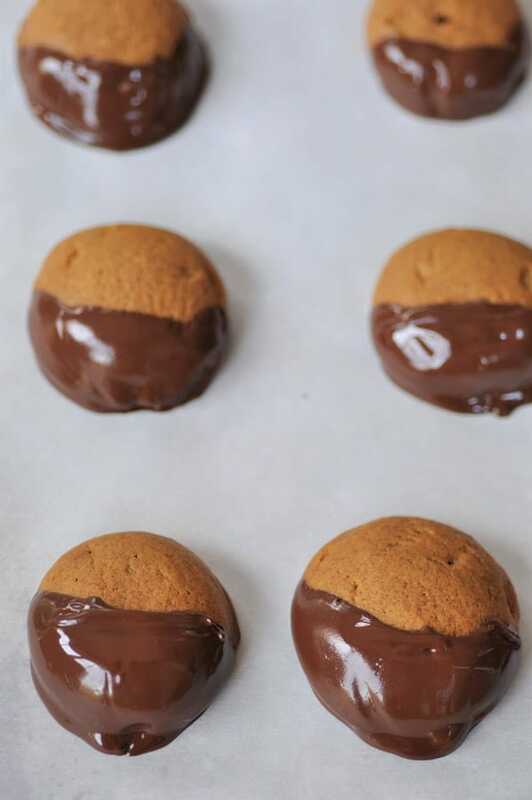 Dip ½ of the cookie in the chocolate and put on a piece of parchment to dry. Work fast so the chocolate doesn’t harden. If it does, reheat it in the microwave. Use all-purpose gluten-free flour for a gluten-free option. 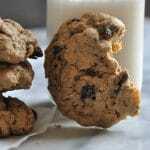 The cookie will be slightly dryer and have a slight gritty texture, which is typical of gluten-free baked goods. They still taste great! Use the chickpeas to make hummus after you open the can to use the aquafaba. The 2nd ingredient in the wet section just says 1 cup....but 1 cup of what? I will for sure be making these!! Hi Carol! Oops, thank you for catching that. :) That's what happens when you write a recipe well past your bedtime. That should read, 1 cup pure maple syrup. It's all fixed now. Let us know what you think of them. Happy holidays! They turned out fabulously!! I did cut the maple syrup amount in half and a bit less of the molasses as I like thinks less sweet. They were wonderful. Thanks. I AM ready for cookie season! These look so perfect for the holidays! My oven is working over time! :) Thanks, Dianne. Yum, these look amazing for cookie season, thanks! These look great Linda. I love how light and fluffy they are. Thank you, Nicole! They're a nice change from the traditional hard gingerbread cookie.